Let me just say this: I’m not really into all the frilly-dilly stuff some teachers are into. In my 6th grade class, we don’t do show and tell, student of the week posters, etc. I just have more important things to worry about. Judge me if you want, but that’s the reality here. Birthdays fall into that frilly-dilly category for me, especially with older students. So to cut to the chase, I do pretty much bare minimum (which is more than they’ll get in junior high, that’s for sure). Before school started, I printed off a bunch of birthday cards and put them in unsealed envelopes. These cards also double as a homework pass for 1 nightly homework assignment, since that’s really what my students (and parents) would prefer to a sticker or a pencil. I leave the envelopes in my desk drawer and can pull them out at a second’s notice, write the student’s name on the card/ envelope and hand it to them. I put their birthdays into a reminder on my computer, so it pops up the morning of their birthday so I can write be prepared. But what do you do to celebrate the birthday in class, you ask? They stand on their chair so we can sing them happy birthday and life goes on. 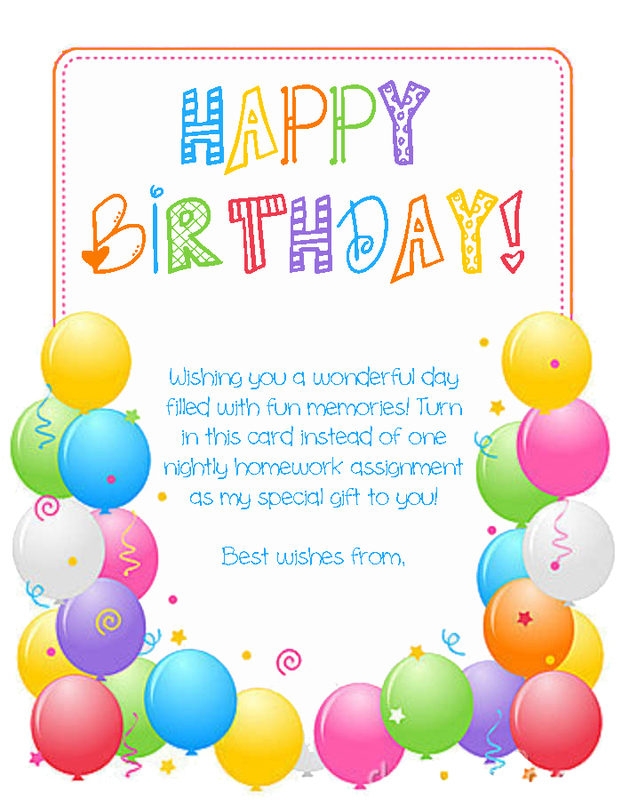 For students whose birthdays are during the summer, I came up with what I think is a GENIUS plan… At the beginning of the year, I told my class that all summer birthdays would be celebrated on the day we have Halloween festivities at school. This way, we combine all distractions into one day, have a huge party (where birthday kids can pass out goodies during the party) and we sing to all of them at once while they’re standing on their chairs. The kids seemed pretty jazzed about it and didn’t even seem to notice that they were sharing a day with other kids. Click here to read about a teacher who did something similar. This entry was posted in Beginning of the Year, Holidays/Seasons and tagged birthday, Children, Education, Elementary School, Kids, Teacher Resources, Teachers, Teaching by Squarehead Teachers. Bookmark the permalink. Sweet! I love that Halloween idea! Thanks!